— Rick Searfoss, a former NASA astronaut who launched on three space shuttle missions before serving as a test pilot for a commercial rocket plane, has died. He was 62. Searfoss died on Sunday, Sept. 29, at his home in Bear Valley Springs, California, according to the Tehachapi News on Friday (Oct. 5). The cause of death was not reported. The Association of Space Explorers, which counted Searfoss among its members, posted a memorial to its Facebook page on Monday evening. An aspiring astronaut since his youth, Searfoss was serving as a flight instructor at the U.S. Air Force Test Pilot School at Edwards Air Force Base in California when he was chosen with NASA's 13th group of candidates, nicknamed "The Hairballs." "I received a life-changing phone call in January 1990 when Don Puddy, Johnson Space Center Flight Crew Operations Director, came on the line and asked, in his smooth bass voice and Texas accent, 'Rick, how'd you like to come on down to JSC and work for me in the Astronaut Office?'" wrote Searfoss in "Liftoff: An Astronaut Commander's Countdown For Purpose Powered Leadership," his 2016 motivational book. "My immediate response: 'I'll be there tomorrow if you want!'" 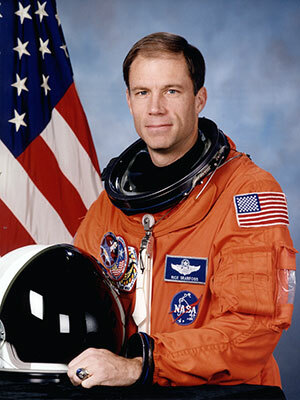 His first mission assignment was as pilot of the space shuttle Columbia. 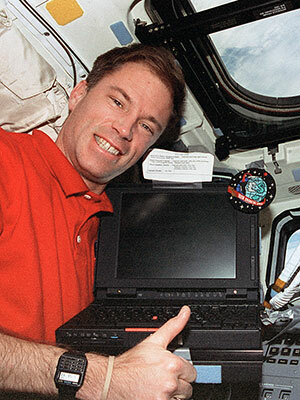 "Chief Astronaut Dan Brandenstein called me into his office. 'Rick, we have a mission assignment for you. You'll pilot STS-58 on Columbia.' Ecstatically, but professionally, I responded, 'Thank you! I really appreciate the opportunity.' Internally, it was 'Woo-hoo! Oh yeah, I'm going to space!'" recalled Searfoss. Lifting off on Oct. 18, 1993, Searfoss and his six crewmates spent two weeks in Earth orbit while studying the physiological effects of spaceflight. 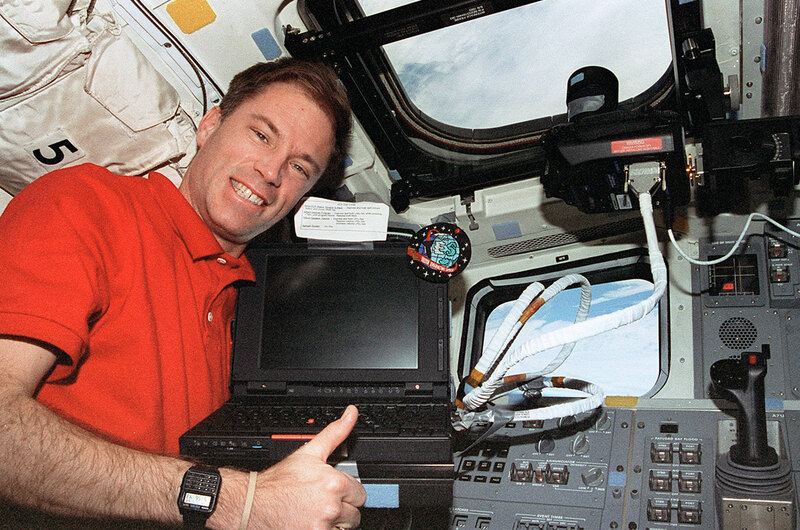 During the 14-day Spacelab flight, which also included 48 laboratory rats, Searfoss helped test a joystick-enabled, laptop computer-based simulator for maintaining proficiency in landing procedures on extended space shuttle missions. He also took control of Columbia as part of an experiment to measure the aerodynamic forces that act on a space shuttle in orbit and during the early stages of entry into the atmosphere. Searfoss' second spaceflight, STS-76, marked his second time as pilot and the third space shuttle mission to dock with Russia's space station Mir. Launched on March 22, 1996, Searfoss and mission commander Kevin Chilton flew the space shuttle Atlantis on an approach to the orbiting outpost after a two-day rendezvous. "In the endgame, we were able to fly Atlantis to a docking port with a displacement error of less than an inch at a precise 0.1 plus or minus 0.02 feet per second closure rate. Not a bad parking job for a one hundred-ton vehicle!" wrote Searfoss in "Liftoff." STS-76 delivered Shannon Lucid (who also flew with Searfoss on STS-58) for a six-month stay on Mir and included the first U.S. spacewalk around two docked spacecraft. "Unbeknownst to us in space, the one available emergency landing site in our time window was Hickam Air Force Base, collocated with Honolulu International Airport, Hawaii. Once everything settled down and we opened the payload bay doors, we learned the flight director had been seriously considering sending us there. 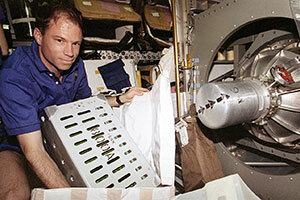 It almost made me wish I'd reported back from the Spacehab module that the latch was a no-go for door opening. It would've been an interesting first to land a space shuttle in Hawaii," wrote Searfoss. His third and final mission saw him assume leadership of a crew. "It was the most incredible privilege I could imagine to be granted command of an American space mission," said Searfoss. The STS-90 "Neurolab" mission launched on the space shuttle Columbia on April 17, 1998, to study the effects microgravity has on the nervous system. According to Searfoss, the 16-day flight was the only shuttle mission to produce a book of peer-reviewed science results over the course of the program's 30 years and 135 missions. It also marked the 25th and final flight of the European Space Agency's Spacelab modules, which first launched in 1983. On May 3, 1998, Searfoss brought Columbia in for a landing at Kennedy Space Center in Florida. 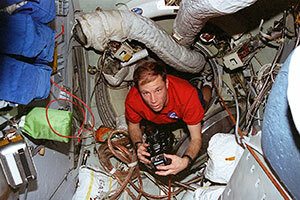 In total, he logged 39 days, 3 hours and 18 minutes in space on his three missions. Richard Alan "Rick" Searfoss was born June 5, 1956 in Mount Clemens, Michigan, but he considered Portsmouth, New Hampshire to be his hometown. Searfoss received a bachelor of science degree in aeronautical engineering from the U.S. Air Force Academy in 1978 and a master of science in aeronautics from the California Institute of Technology (Caltech) on a National Science Foundation Fellowship in 1979. He graduated in 1980 from undergraduate pilot training at Williams Air Force Base in Arizona. From 1981 through 1984, Searfoss flew the F-111F tactical strike aircraft at RAF Lakenheath, England, followed by a tour at Mountain Home Air Force Base in Idaho, where he was an F-111A instructor pilot and weapons officer until 1987. In 1988, he attended the U.S. Naval Test Pilot School at Patuxent River in Maryland, as a U.S. Air Force exchange officer. Rising to the rank of colonel in the Air Force, Searfoss logged more than 6,100 hours in 84 different types of aircraft. After joining NASA but before he made his first spaceflight, Searfoss served as a "Cape Crusader," part of a team responsible for crew ingress prior to launch and crew egress after landing. 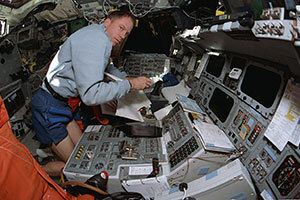 Subsequently, he was assigned to flight software verification in the Shuttle Avionics Integration Laboratory (SAIL) at Johnson Space Center in Houston and served as the Astronaut Office representative for both flight crew procedures and shuttle computer software development. Searfoss also served as the vehicle system and operations branch chief, leading a team of several astronauts and support engineers working on space shuttle and International Space Station systems development, rendezvous, landing and rollout operations, as well as advanced projects initiatives. 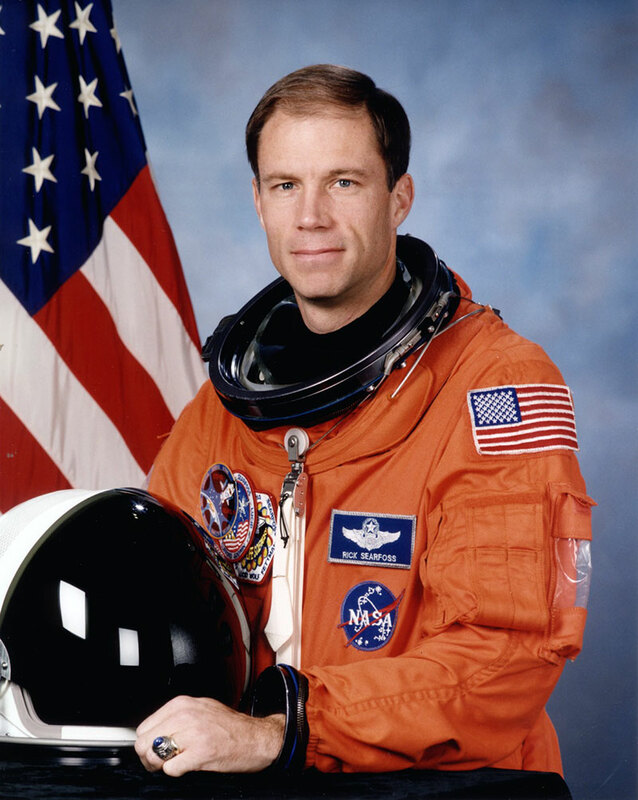 Searfoss retired from the astronaut corps and the U.S. Air Force in 1998, but his departure did not mark the end of his work as a pilot. From 2001 to 2003, Searfoss flew as a research pilot in the flight crew branch at NASA's Dryden (now Armstrong) Flight Research Center in California. 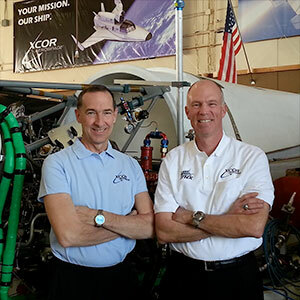 Searfoss was appointed the chief judge of the Ansari X PRIZE, presiding over the $10 million contest won in 2004 by Scaled Composites' SpaceShipOne for the first privately-funded, suborbital crewed vehicle to fly into space. 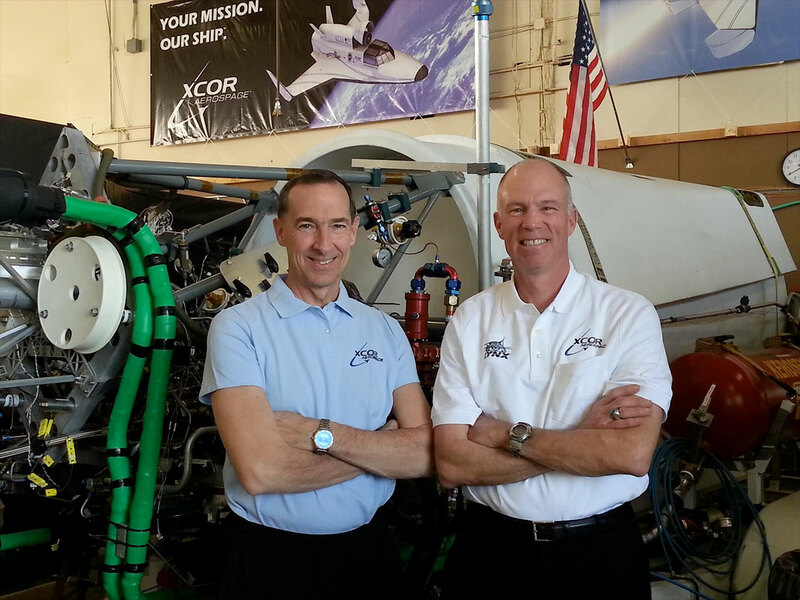 He was also one of two test pilots to qualify to fly the now-former XCOR Aerospace's EZ-Rocket, an experimental rocket plane and predecessor to the planned Lynx suborbital space plane. He served as an instructor pilot at the National Test Pilot School at the Mojave Air and Space Port in California, a consultant and motivational speaker. Searfoss also advised several Hollywood movies, including "The Core" in 2003 and "Oblivion" in 2013. He had a cameo appearance in the 2011 superhero movie "Green Lantern" starring Ryan Reynolds. In 2008, Searfoss appeared in a television commercial for Volkswagen, appearing opposite a "talking" VW Beetle. Searfoss was the recipient of the Air Force Commendation Medal, a Distinguished Flying Cross and NASA Exceptional Service and Outstanding Leadership medals, among other awards and honors. Searfoss is survived by his wife, Julie (McGuire), and their daughters Megan, Liz and Camille.